Producing purebred Cane Corso puppies bred from AKC Grand Champion show dogs, Omaggio Cane Corso is a dedicated Show Breeder with occasional litters of puppies, located in Franktown, near Denver Colorado. 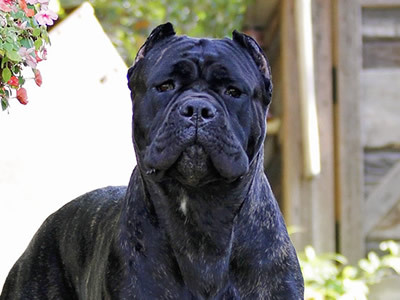 Omaggio Cane Corso was founded in 2010 by Rachelle & Chad Cline. After spending many years with Rottweilers, Dobermans, and other working breeds, a passion for this incredible breed was sparked when their son Steven introduced them to the breed and Chad surprised Rachelle with their first puppy. Diesel became the foundation Cane Corso at Omaggio, and the beginning of extensive dedication, training, research, and mentoring that continues to this day. The initial infatuation with this breed was flamed into a full blown love affair by the intelligence, eagerness to please, and the protective nature of these wonderful dogs. It was only natural to progress from enjoying wonderful family companions to competing in the conformation show ring, and then other AKC working events such a lure coursing, barn hunt, and most recently scentwork. Omaggio Cane Corso Kennel is a tribute to a number of dedicated Cane Corso breeders before us, without whom our journey would not have begun - breeders who have spent years pouring their hearts, souls, blood, sweat and tears into this magnificent breed we all love and cherish. Omaggio Cane Corso has been built on the foundation of these breeders that have mentored, educated, and welcomed us into the Corso community. You know who you are! Omaggio Cane Corso Kennels sends out a “Mile High Salute” to you all!